Note: "Please be advised that under current Anne Arundel County Law, biking (motorize or not) off of a paved surface in a County Park is prohibited." Nice network of singletrack and a bit of gravel access road (which can be avoided all together). 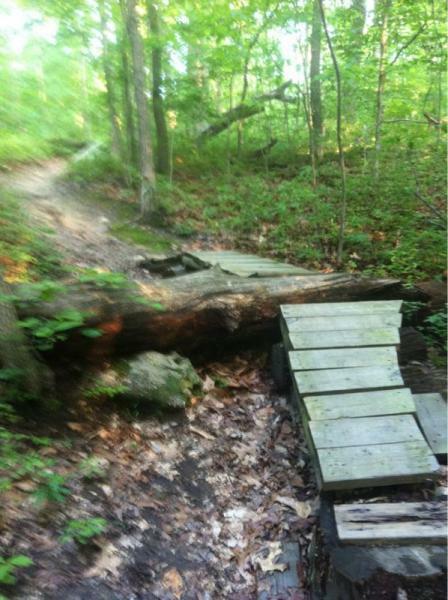 A few built up log obstacles, some small climbs and a few short steep decents, a couple creek crossings. Generally well maintained except for a few sections. Can easily ride for an hour or so without going over the same section of trail. Review: As with most trails around here, you need to knownwhere to go to find the good runs and get the loops figured out. Been back here 40 times in the past few years. There's a long climb which leads out to power lines, turn right at a small fenced in station and enter the woods for a good descent trail with roots and rocks. I've gotten speeds in upwards of 34mph down this trail. Very very fast and fun. A few other good loops back here as well. Review: Basically a walking trail with no obstacles. Many overgrown spots. Review: Great place to ride after work. I have been to this area about 10 times and still find some hidden areas, but can definitely tell this trail has seen some much better days. Log rolls are rotted and some areas are slightly over grown. There are a few creek crossings and a bridge, some jumps and decent downhills round out the features. Great place to have some fun after work. Review: I used to do a mountain bike race here by Team Snow Valley in the 90's called "Pshchocross". Really fun, multiple lap, muddy courses (changed every week). Been here the other day, and the area has seen better days. Looks like a lot of motorized vehicles and little trail maintenance. Great local or afterwork ride. You have to do multiple laps to get a decent ride in. 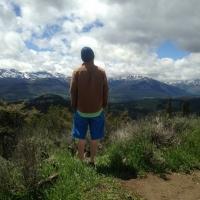 Review: Very fun trail. One of my local rides. Not an epic singletrack trip, but a lot of fun. Jump lines, a drop or two, decent climbs and some good flow. Good for XC, AM, and even FR on some features. Definitely worth a short trip to explore. 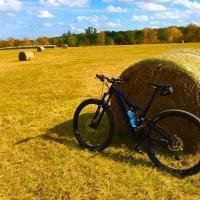 Agree with other post that it is a fun trail to ride and stop to play at various locations. Review: Nice ride in a not-so-isolated suburban area. Built-up opstacles and stream crossings are the park's best attraction, though there are a few nice, albeit short, climbs and descents. Similar Trail: Portions of Potapsco. Review: This trail is not great singletrack and could be ridden by a beginner. Although, there is plenty to do for an advanced rider. All kinds of obstacles, challenging ramps up and down logs and over water, log steps up cement sewer pipes, dirt ramps and more. I like to go and chill on one obstacle. Oh, and I have went over my handlebars twice here. Odenton Park MTB Trail 3.30 out of 5 based on 10 ratings. 10 user reviews.